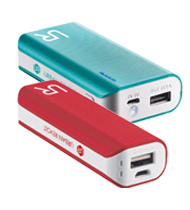 Stay charged when out'n'about with Portable Power Banks from Soundstore. We stock only the leading brands. Fast and reliable delivery nationwide. - Hassle free wireless charging. - Quick charge: charges 1.4 times faster than standard charging devices. - Compatible with iPhone X, iPhone 8/8+, Samsung Qi enabled smartphone. Best choice for power on the go.